What Jobs Can 18-Year-Olds Get? What Jobs Can 18-Years-Olds Get? When you are just starting out in the world of work, you’ll want to focus on finding entry-level positions, which require the least amount of experience or skill. Some companies have education requirements, so be sure to check the qualifications on the job ad. When you are looking at job ads, look for the keywords like “training provided,” “entry-level” or “no experience necessary”. Everyone has to start somewhere. Fill out some applications, do your best at each interview and soon, you will be earning a paycheck and gaining the skills needed to land a career you can be proud of. As you start your journey to find the career you want, it can be difficult to know where to begin. Many industries hire young people without experience for entry-level jobs. Some places to look for work include hotels, fast-food or other restaurants, factories, warehouses, retail stores, grocers and staffing agencies. Working with a staffing agency after high school can give you an advantage over your peers. 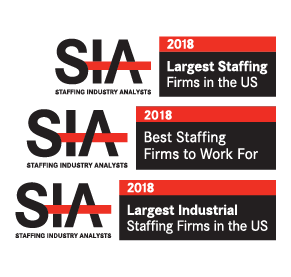 A staffing agency offers opportunities to get started with reputable companies in your area that may offer long-term advancement opportunities. Even if you work several different assignments, you will gain skills which will help you identify the career that is best for you. Can my volunteer work or school activities help me find a job? Don’t underestimate your non-work experience. Volunteering or participating in extracurricular activities often provides related skills which can be included in your skill set when applying for a job. If you helped around the house, farm or family business, you could add this experience as well. Just because you didn’t receive a paycheck, doesn’t make your experience less valuable. What kinds of industries have entry-level positions open for 18-year-olds? Can I have a high-paying career without going to college? Skilled trades positions are well-known for offering great pay for your expertise. Skilled trades positions are jobs that allow you to work with your hands, but require specific training and specialization. Typically, people in skilled trades positions attend a trade school or a community college, earn certification and have an apprenticeship. Welders, electricians, plumbers, carpenters and CNC machinists are just a few examples of skilled trades professionals. Because skilled trades positions require special expertise, these jobs offer great salaries. In fact, you can sometimes earn more with a skilled trades job as you can with a four-year degree. Although trade schools do have tuition fees you must pay, they are typically much lower than traditional colleges and scholarships are available for trades programs. While you will probably have to attend trade school before you can land a great-paying skilled trade job, some companies offer on-the-job training or apprenticeships, which allows you to gain the skills you need to advance your career. If you already have a specialized skill, you may be able to land a job without attending trade school. Many employers require you to be at least 18 years old to work in their facilities. Some jobs have additional requirements based on the type of skills required. Are there any jobs that will allow me to continue my education while working? Scholarships and tuition reimbursement programs are offered by some companies to help workers learn additional skills and advance their careers. For instance, Ōnin Staffing offers the Endeavor Scholarship, which helps our Teammates pay for professional certifications and tuition for classes of any kind, from traditional college to trade school. When applying for jobs directly, or with a staffing agency like Ōnin Staffing, look for incentives that will help you land a great career in the future. Are there well-paying jobs for 18-year-olds? Are there any legitimate online jobs for 18-year-olds? You are wise to question if a job offer online is legitimate or a scam. Providing your personal information online can be risky. Be sure you verify the company is legitimate first by asking for the name of the person you are speaking with, as well as the business name, address and phone number. Be sure to verify the company’s information online. If the position still seems too good to be true, look for reviews online and on social media. You can also check with the Better Business Bureau. Always be careful with your personal information online. If a recruiter asks you for personal information, like your credit card information or tells you that you must pay to get a job, you are probably talking to a scam artist. Instacart is a grocery delivery service where you set your hours. Fiverr allows you to be paid for web design, writing and video production gigs. You can accept or decline job offers as you like. Gigwalk lists short-term job opportunities in your area. The amount the gig pays and other details are listed. All you have to do is accept and complete the gig. Lyft or Uber are ride-sharing companies that allow you to drive others in your car. You can set your hours and the areas you are willing to work in. Carefully research any job you are considering before deciding to work online. Once you have established the company is a legitimate company, go after your dreams and make that money! I’m going to be 18 soon, and I need to start working. What kind of jobs should I apply for? There are many great jobs available. As you begin your career, it’s important to focus on what you want to do and determine how you can gain the skills to get there. Remember, not all education is obtained in the classroom. You can use your experience in an entry-level job to obtain the skills and experience you need to start your dream career. For example, if you want to own a home remodeling company, you will need carpentry, design, landscaping and other skills to have the knowledge to start your business. You could start gaining those skills by working with a lawn mowing service, a construction crew or a retail store that specializes in home repairs. When trying to find your first job, a great place to start is a staffing agency, where short-term and long-term jobs are typically available. A recruiter will work with you to find the best opportunity for you to try working in a specific industry or start your career. It’s a great way to gain the experience you need to advance your career in the future. If you’re not sure what kind of career you would like, working with a staffing company is also a great way to try different types of jobs to determine what positions you like and what you’re good at. Identify what you would want to do every day, and think about what skills you will need to do that. Then look for opportunities to learn those skills on the job. You will gain experience and create the foundation to build a successful career on. Am I allowed to work five days a week if I’m only 18? As an 18-year-old, you can perform almost any job and work as many hours or days as you want. While there are a few exceptions (for instance, you cannot work as a bartender until you are 21 in many states), most youth labor laws no longer apply to you. I’m 18 and very introverted. What are some job ideas for a shy person like me? Seeking a first job can be intimidating for anyone, but when you are shy by nature, it can seem overwhelming. Recognize the skills you bring and the value you offer as an employee. What are your unique talents? Be sure to highlight them in your interview. Consider looking for work in a job field which interests you. Other jobs which may be a great fit could include stocking, warehouse, production, housekeeping, dishwashing, janitorial or working online. There are several services that hire for entry-level positions which you can work from home. If you are a creative person, a website like Fiverr could be a great first job for you. Gigwalk and Instacart are websites that let you choose the jobs you want and when you want to work. Focus on your gifts, what you want to do and the income you would like to make and use that to help guide you to the job you would like. 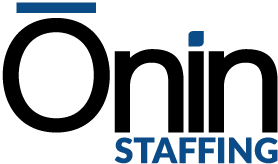 Working with a staffing agency, like Ōnin Staffing, will allow you to interact with a recruiter who will seek out jobs with multiple employers that would be a good fit for you. With one application and one interview, you can potentially find more than one job you would enjoy. I found a job I want to apply for, but it requires a resume. I’m 18, and this would be my first job. What should I put on my resume? Your resume is a reflection of you, your experiences and skills. It is a form of branding yourself, so employers know what sets you apart from other applicants. Determine if you have any skills you can add to your resume. Did someone teach you how to repair cars or build small structures? Do you make YouTube videos and edit them? Do you know how to work with wood? Do you volunteer for fundraisers and meet or beat your sales quota? Were you active in any extracurricular activities in high school? Do you speak more than one language, or do you code? These are all valuable skills. Be sure to list them and your experiences. Focus on accomplishments, such as awards that relate to the job you are applying for or from which you learned a valuable lesson. Even stating your improvement levels in your sport, with a metric to back it up, will show you know how to set and reach your goals and have follow-through. Be sure to include a summary statement about yourself, explaining briefly why you are interested in the job and highlighting why you are the best candidate. Not having job experience can be a positive thing; you enter your position without prejudgments or old ways of doing things, which can inhibit learning. You are a blank canvas, ready to become a masterpiece. I’m 18, and I’d like to work in the healthcare field. What kind of job am I qualified for in a hospital? If you are interested in a job in the healthcare profession, there are some entry-level jobs which will provide you with experience and – possibly – training. One great place to start is as a health aide either visiting individuals’ homes or in a facility. Some companies even pay for training to get you certified as a Certified Nursing Assistant. Medical office jobs can also be a way to start in the health services field. As a receptionist, biller or assistant, you will be exposed to the jargon and practices of a medical office. This will give you an opportunity to see if the field is right for you. If it is, some companies offer financial assistance to help you return to school for training in nursing or medical practice. Finally, another way to enter the medical field without training or prior experience is as an aide. Some group homes, mental health facilities and other agencies have entry-level aide positions. Aides typically take care of the daily needs of patients, including mobility assistance, transporting patients from room to room, or just supervising the welfare of those in the facility. You can take these early experiences and turn them into a career with further training and education. In the meantime, you will earn a paycheck and gain real experience in a career you want to pursue. I need a resume, but I’ve never written one before. How do I write one? A resume should showcase who you are and what you bring to the table as an employee. 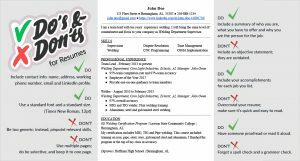 There are several templates you can use to help you fill in your information, or you can create your own resume following a few simple rules. Be sure to include your name and contact information at the top. An employer can’t reach you if you do not provide your address, phone number and email address. Be sure to include that information where it can be easily seen. If you have a LinkedIn profile, be sure to include that too. From here, follow the “F” style, and keep the most important information in the top third of your resume. Left justify everything and make sure the important stuff, like work titles, are leading the description and to the left. Most recruiters read in this pattern, so use that to your advantage. Do not include an objective statement. Instead, create a summary statement which explains who you are, what experience and skills you have and why you are the right person for the job. In the next section, list your skills in evenly spaced bullets across the page. Columns of three will look nice, and remember to left justify all of your content. Make sure your resume is only one page long. Recruiters want to be able to glance at your resume quickly to determine what kind of candidate you are. List any work experience you have. If you have several jobs to list, select the most relevant and list those in detail. Be honest and include any accomplishments or skills you learned on the job. Titles or promotions are important, as well. After you have listed your work experience, list your education in the next section. This includes your high school diploma and GED. If you are enrolled in a certification program or trade school, list that first. If you do not have work experience, you can include a section on volunteer experience you may have that provided relevant experience. You can also include activities, clubs or work around the home which would be relevant. I’m 18, and I don’t have a diploma or work experience, but I need a job. How do I get one? Trying to start a career or even find a first job can be overwhelming. Don’t get discouraged if you don’t get a call back right away; just stay positive and be persistent. The most important thing to do is to start applying. Look online for jobs open in your area, and be sure to read the qualifications. Don’t forget to consider the experience you may have outside of a job, such as mechanical, household, public speaking or technological. Ultimately, having a great work ethic, a mature attitude and a willingness to learn may be more valuable than any kind of hard skill. While education is important, many people do not have a diploma and work in jobs that pay well. However, many of these industries require experience gained over time to earn higher pay rates.